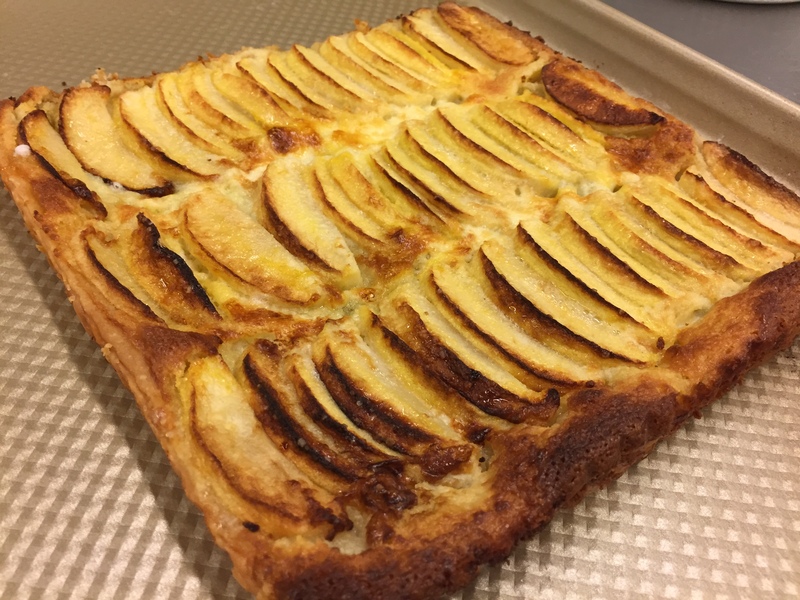 When I was in Paris I had this apple dessert, similar to a cheese danish. It was beyond delicious, and I haven’t stopped thinking about since. I couldn’t remember exactly what made it so special, except that it had crème fraîche in it. So I set out over New Years weekend to make something similar that would bring me back to my time in France. Cut any remaining pastry off the tops to make an even, flat base for the dessert. In a food processor, add almond paste and butter. Whip for a few minutes until combined, light and fluffy. Add sugar, and whip for 1 minute. Add egg, and let whip for another minute until combined and smooth. Peel, core, and slice apples about 1/2 an inch thick. If you want to do them ahead, toss them in 1 tablespoon of lemon juice to keep from oxidizing. If you will make tart right away, you don’t need to do this step. Take your tart pan with pastry already laid into it. Spoon frangipane over the dough evenly. On top of the frangipane layer, spoon the crème fraîche. Smooth it evenly over the top not to combine layers. Next, lay the apples into the crème fraîche, evening in rows of three. They should overlap each other just a little. Brush the top with your egg wash lightly, not to put too much or it will pool over the dessert. Sprinkle the demerara sugar over the top of the dessert evenly. Bake in a preheated oven at 400 degrees for 40-45 minutes, rotating 2 times. 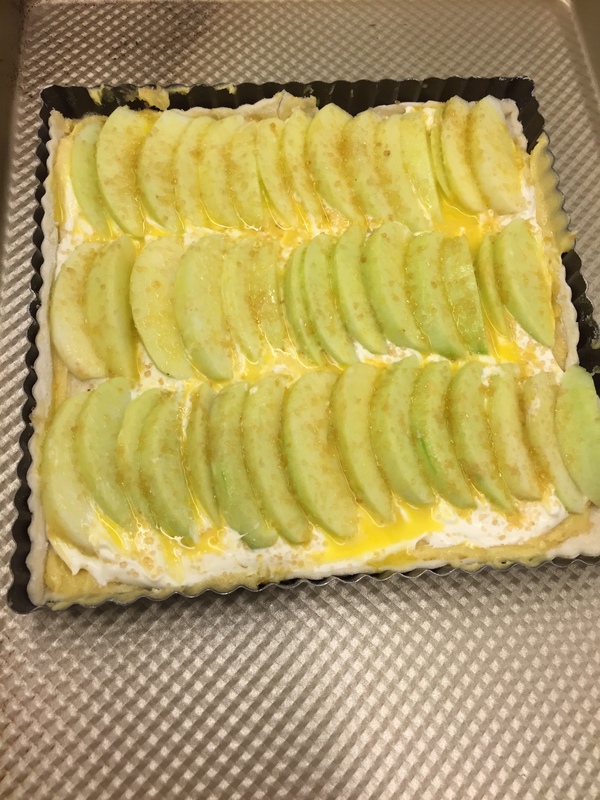 The tart will be done when it is golden brown, the crust has puffed and is cooked all the way through, the apples are soft, and the sugar has caramelized on top. Allow to cool 10 minutes before removing from the tart pan. Place on a cooling rack another 10 minutes and serve either warm or room temperature. 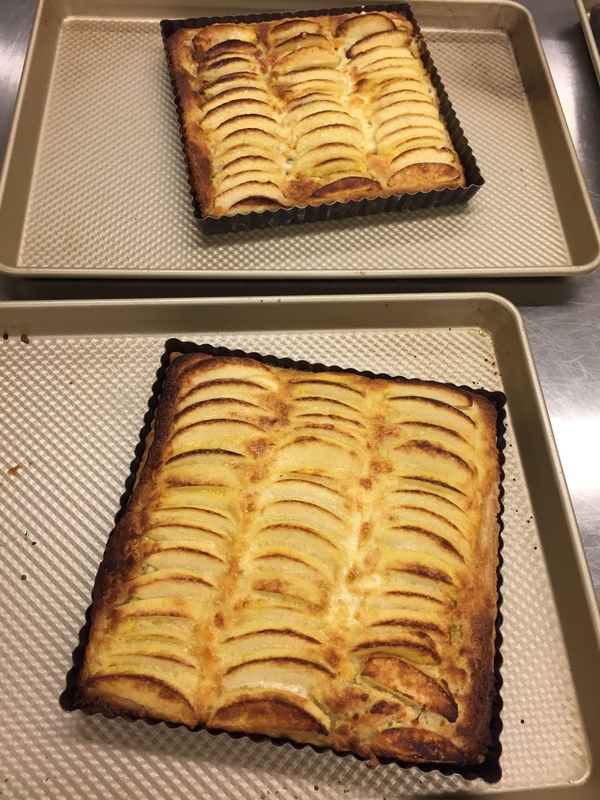 This tart takes a small amount of time to assemble, but is super impressive to guests, and absolutely delicious. 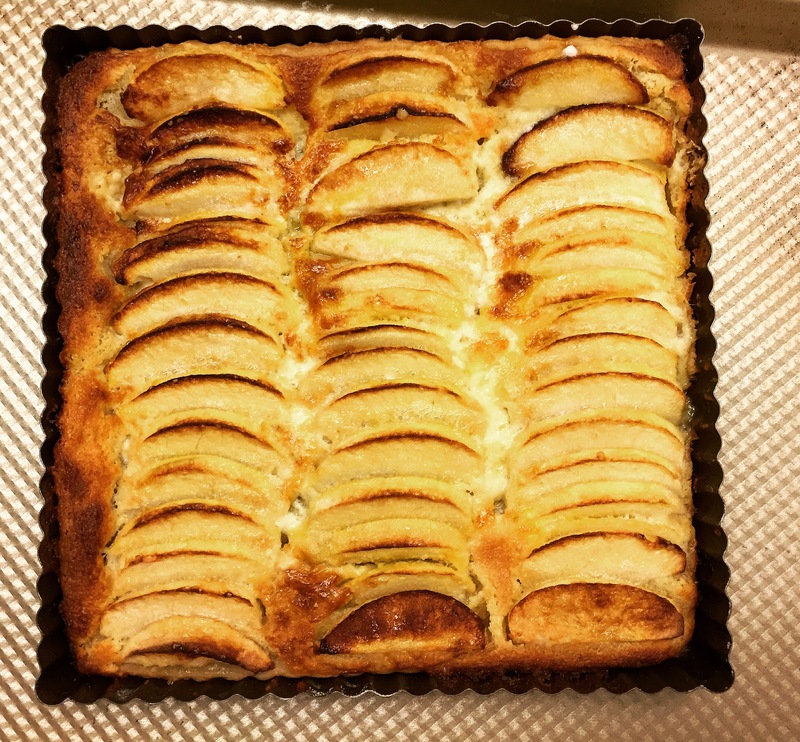 The flavors of rich almond and tart apple go so well together and when the crème fraîche bakes, it becomes a creamy, almost cheese-like layer in this dessert, making something completely unique and memorable. This past Summer I spent two months cooking for a private family abroad in France. It was my first time to France, and I arrived not speaking a word of the language and completely unaware of how life changing the experience was going to be for me. About a month into my stay in France, I journeyed to Paris for five days. I took a beautiful train ride that cut from the coast of La Baule to the city of Paris. When I arrived, a car took me to Ile Saint Louis, where I stayed in a stunning chateau. It had floor to ceiling windows that opened out to a large courtyard below and the quiet, quaint streets of the island. I ventured out into the maze-like streets of Paris. I refused to buy a map, but discover the city of my dreams on my own. I memorized landmarks and navigated my way through the city. My first day was overwhelming. Starving, I decided to walk through le Marais and find an authentic dining experience in Paris. Everywhere I looked was filled with tourists. I walked through seemingly endless side streets and alleys until I came across a tiny storefront of a restaurant with patrons spilling out the windows and entryway. I knew I had to eat here. The smell coming through the door of the restaurant was amazing! It smelled of slowly cooked meat, char, and smoke. I pushed through the door and saw a room with fresh produce on wood shelves, big bowls of lemons and heads of cauliflower. The menu was scribbled on a chalkboard wall in bright colored chalk. The kitchen was completely open, and the cooks prepared the food right in front of you as you ordered. There was minimal seating, and the crowd was loud and joyous. It felt like I had entered someones home, like everyone there was family. I stood awkwardly- waiting for someone to wait on me, or take an order – it never happened. I felt so embarrassed, I almost left. Then I decided to step out of my comfort zone, and I plunged myself down at the counter bar, and sat next to a beautiful pregnant woman. I sat a few minutes, and then pushed myself to talk with her. I nervously asked her if she spoke English, (which she did, thankfully), and then proceeded to ask her how to order. I then explained I was a NYC chef visiting Paris, and wanted to taste the best food the city had to offer. She explained to me that her husband owned the restaurant and that I was indeed in the right place for good food. She brought her husband over, and the three of us spoke about middle eastern food, restaurants, New York, and Paris. It was one of those experiences you don’t forget, and then the Chef decided to order for me. The man working the counter was a combination host, maître d, and comedian. He poured me some warm red wine on this balmy 95 degree day. The restaurant was open to the street, and the heat everywhere. My clothes clung tight and wet to my body. A runner brought over some fresh made pita with side dish of tahini with tomato water and spiced olive oil. I dipped the hot fresh pita into the cool spread, and it refreshed me. Next came out the most incredible boeuf bourguignon stuffed pita. The combination of french and Israeli flavors are absolutely delicious, and was the singularly most delicious and memorable thing I ate in all of France. At the same time, they brought out a whole roasted head of cauliflower. It was perfectly tender, roasted nicely with salt and oil. You cut off sections as you ate it, and it made for a perfect accompaniment to the meal. If you’re in Paris, and venture into le Marais, you must check out Miznon.